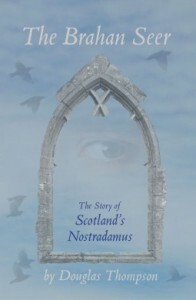 Thompson's reinterpretation of the life and legend of Coinneach 'Odhar' Mackenzie, the renowned seventeenth century prophet known as the Brahan Seer, falls somewhere within the regions of an academic exploration of a (contested) historical figure and a fictional experimentation with the 'safe concepts of what the human mind should be capable of'. The use of the third person present is an unusual choice for a novel about a prophet, but is a stylistic feature that the reader will soon become accustomed to. On the whole, the narrative device lends an atmosphere of immediacy to the novel and goes some way to represent the oral tradition through which we come to know Coinneach Odhar. However, while Thompson does well to evoke the fug of myth that surrounds the Brahan Seer, a desire to foreground the prophecies of Coinneach Odhar overshadows any real character development. Crossing the water, the Seer nearly loses his stone from his hands: as German U-boats begin to erupt through the water's surface on either side, rocking the small boat, dousing him in spray. And strange as it may seem to you this day, Coinneach continues, a time will come, and it is not far off when full-rigged ships will be seen sailing eastward and westward by the back of this [Tomnahuric] Hill (in 1822 The Caledonian Canal is cut and completed at this point, linking together all the inland lochs of the Great Glen into one continuous waterway from west to east coasts). Sadly it is by way of the latter that a large proportion of the novel is delivered. often the dialogue feels forced and unnatural with many 'illiterate peasants' managing to deliver pithy and verbose speeches; Coinneach Odhar may well be renowned as being a wit, but I found it difficult to believe that every uneducated peasant in seventeenth century Scotland was as well. I see how this town will change. I see it clearly. People such as yourselves but in strange attire. They will be weaker and more effeminate than you, their women shameless, their ministers voiceless. Thompson demonstrates a clear passion for his subject and this filters through into the narrative of The Brahan Seer, the history is largely accurate and explores both an interesting period and character. The deviations he takes from the conventional myth work well within the confines of the novel and, while it may ruffle the feathers of true Odhar fanatics, will undoubtedly inspire readers who are unfamiliar with the life of Coinneach Mackenzie to seek out more information. Helpfully, in his afterword, Thompson relates the generally accepted tale and suggests some areas of further reading whilst reminding us that The Brahan Seer is merely his interpretation of the prophet's life. But, as the rekindled story of Scotland's Nostradamus, a 'real-life' character, I expected more of The Brahan Seer, and after finishing the one hundred and fifty six pages I couldn't help but feel that Thompson might have given Coinneach more; too long to be a short story and yet too short too clichéd to be a good historical novel. Phillip Clement studied English and Creative Writing at Aberystwyth University. Since he left there he has lived in a library, written short stories and reviewed books. Currently he is preparing to begin a PhD exploring themes of identity and self in fiction.